Adds several bullet-consuming defense equipment. Designed for vehicle grids, function as gun pods (external mount guns) like in modern military aircrafts. Suitable for moving turret creep tactics. Also adds dedicated pods for armoured trains. Bored by using personal laser defense equipment only? Want some defense equipment not using power? Want the autocannons (from Schall Tank Platoon mod) autofiring? Want to do turret creeping, without having to construct and deconstruct (and place poles or bullets) at the time? Then I proudly present this mod for you! This mod fulfills all these wishes! Train autocannon pod (20 mm). Train cannon pod (75 mm). Place into vehicle equipment grid like other equipment. Note that the "empty" gun pods cannot be placed into grid directly. They have to be loaded with their respectively ammo first (via crafting, like crafting a fully loaded gun pod). Rocket pod: all vehicles and tanks. Gun pod (or MG Pod): all tanks. Minigun pod: medium tanks or above. Autocannon pod (20 mm): medium tanks or above. Cannon pod (75 mm): heavy tanks or above. Flamethrower pod: heavy tanks or above. Particle beam pod: all tanks. Particle cannon pod: heavy tanks or above. Stasis beam pod: all vehicles and tanks. Force cannon pod: all vehicles and tanks. Train minigun pod: armoured locomotives. Train autocannon pod (20 mm): armoured locomotives. Train cannon pod (75 mm): UNUSED YET. Therefore, cannon pods cannot be mounted on a light tank. A heavy tank, however, can have any types of gun pods. Train pods are usable only on armoured trains from Schall Armoured Train. On hovering mouse cursor over the gun pods, you will see "energy consumption" values. That is not case, as all the gun pods from this mod neither consume nor charge from batteries or generators. The "electricity" bar, however, is a useful information, since it indicates how much ammo is left in the gun pod. The bar shortens according to how many times the gun pod has fired. A MG pod has 1000 shots, while a rocket pod has 100 shots. When the bar depletes, the gun pods will no longer fire. The damage and shooting speed, however, are fully preserved. All gun pods also benefit from the same upgrades as their original guns and ammo. Since the "electricity" is not intended to be used as ammo bar in vanilla game, removing a partially/fully filled gun pod will not return the remaining ammo to the inventory, if clicking on the equipment directly. Here is an example showing the introduced features. We now have 3 groups of gun pods like in the picture. The group of 2 gun pods (MG pods) are both half-full (500/1000 bullets, or 50/100 magazines each). 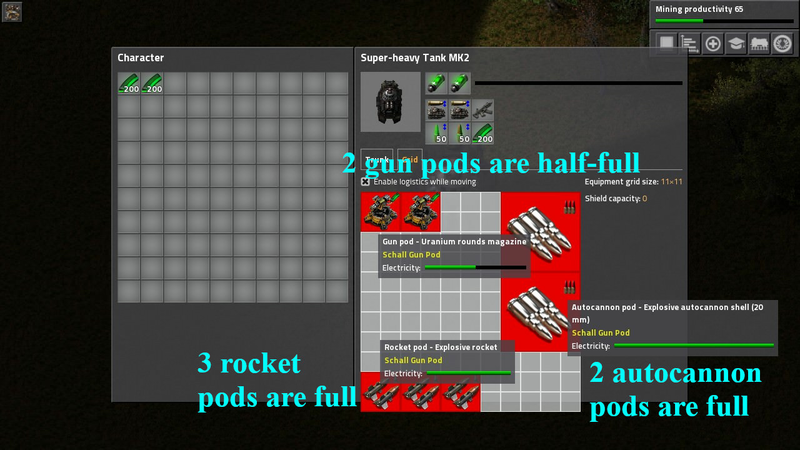 The group of 3 rocket pods are all full (100 rockets each). The group of 2 autocannon pods are also full (1000 shells, or 100 magazines each). 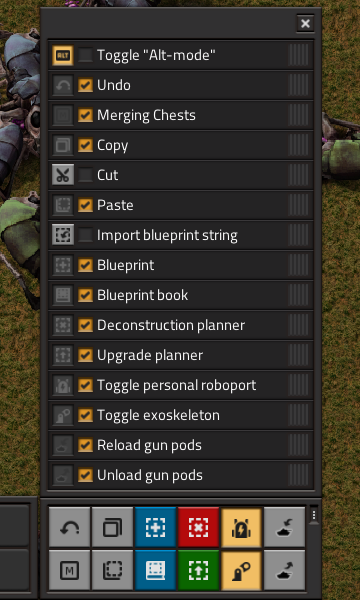 On pressing the hotkey (default: Control-L), all gun pods are unloaded, returning unused ammo together with empty gun pods back to the inventory. Counts on returned ammo are displayed in the message area. The empty gun pods can be reused via crafting. Since 0.17.1, if player is on the train, the unload action will be performed on ALL carriages. Flying texts will notify where the unload occured. There is a reload gun pod hotkey (default: Shift-L) introduced, to fill partially filled or empty gun pods if there are ammo of the same types in player's inventory. 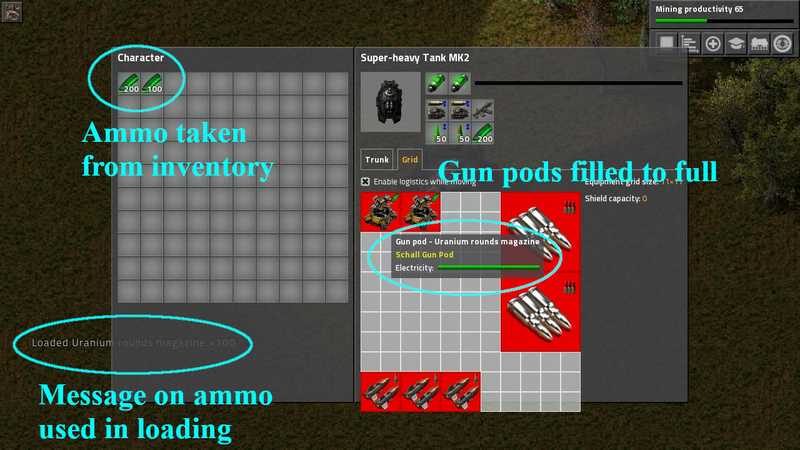 Using this feature, it is no longer needed to unload gun pods, craft to load gun pods, and place them back to inventory. These three steps are replaced by a single hotkey. 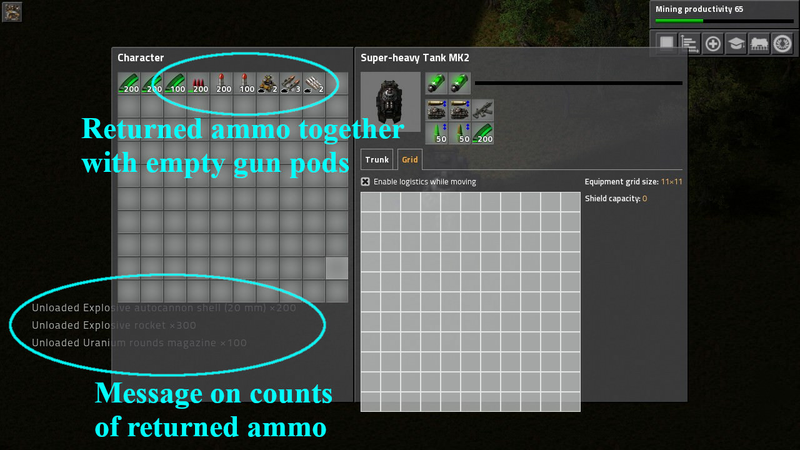 Using the same example, if we do not unload but press the reload hotkey (default: Shift-L), ammo are taken from inventory to fill the partially-filled gun pods, as shown in the picture. 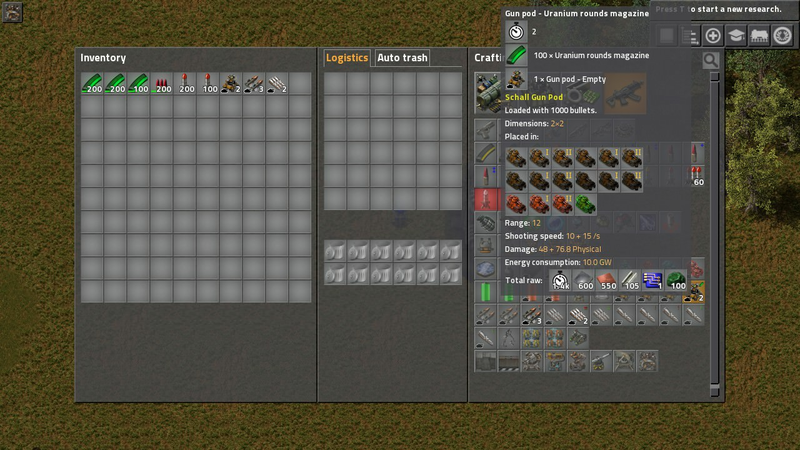 Since 0.16.2, you can also reload/unload pods without opening the inventory screen. Just press the hotkey any time during driving. Since 0.17.1, if player is on the train, the reload action will be performed on ALL carriages. Flying texts will notify where the reload occured. From 0.17.1 onwards, shortcuts are also introduced. They are equilvalent to pressing the above-mentioned hotkeys. For more details and stats of all gun pods, please see the FAQ section. Schall Tank Platoon is strictly required, since these gun pods are designed to be installed into vehicle equipment grids, which is provided by this mod. Schall Ammo Turrets is strictly required, since the tech prerequisites and recipes are based on the turrets, after adjustments in 0.16.2. Schall Alien Tech is optional but recommended. The ammo-consuming particle pods are extension to this mod, thus will only appear if this mod is installed. Schall Armoured Train is optional but recommended. Some dedicated train gun pods are dedicated to the armoured locomotives of this mod. These gun pods will only appear if this mod is installed. Schall Alien Mutation has introduced some laser-resistant against your personal laser defense. These gun pods are the best to deal with them! The gun pods may or may not be placeable on vehicles from other mods. If you have any favourite vehicles wanting to be supported, please leave me a message in the Discussion section. Aircraft Gun pods and rocket pods can be installed to those aircrafts. Heavier pods cannot be used, since I guess it is not reasonable to have cannon pods in a fast jet. HeavyTank 2° Gen has some similar ammo turret equipment dedicated for those completely new tanks. But it has its own script to handle placement, so ammo unload/reload features are not supported yet.